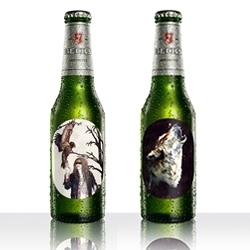 Music and beer are perfect companions, and now Becks have taken that one step further with these limited edition bottles designed by Ladyhawke. Ladyhawke used illustrations by her best friend, Sarah Lanarch, who has created much of Ladyhawke’s artwork including the cover of the eponymous album. Here is an interview with Ladyhawke and Sarah about how they met.